Most of the photographs on this page are from The Story of the Exeter Blitz published by Wheatons, circa 1945, and the Exeter Phoenix by Thomas Sharp also circa 1945. 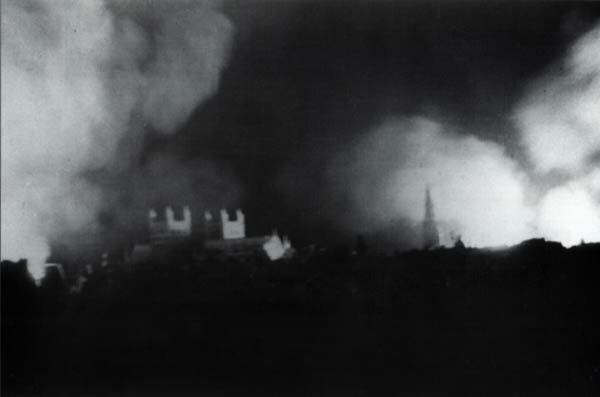 This is believed to be the only photograph taken during the 4th May 1942 blitz. 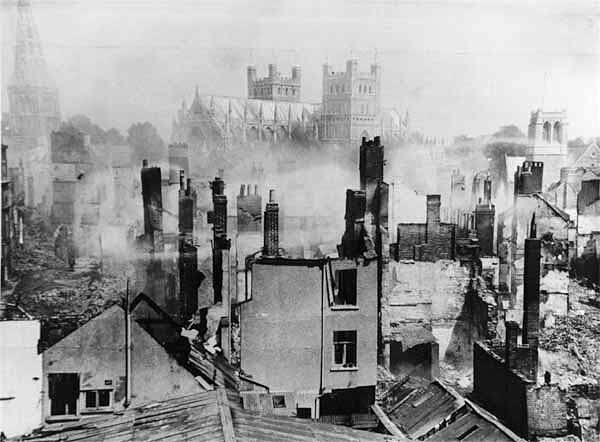 Taken from the top floor of the Rougemont Hotel, it shows the glow from the fires illuminating the billowing smoke, with the Cathedral in the centre. The glow on the right corresponds with the Lower Market and top of Fore Street, while that on the left with Bedford Circus and the High Street. Courtesy Isca Photographic Collection. This photograph was taken in the late afternoon of the 4th May. 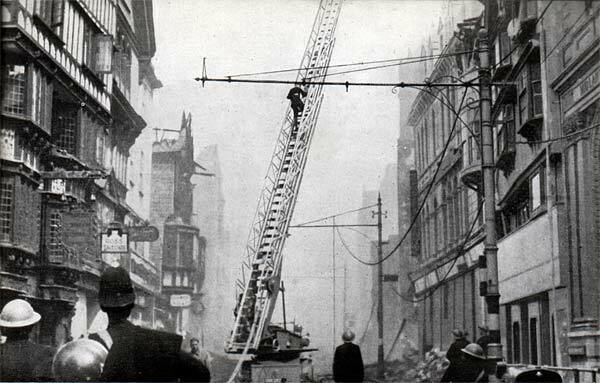 The National Fire Service had been fighting fires for about 16 hours when the call went out "send Turntable Ladder immediately to Colsons - relay will be available on arrival", as fires from Catherine Street had spread into the store. Here, a turntable ladder is used to direct water into the top floor of the building. It is said, that a 4ft 6in (135 cm) thick cob wall saved most of the store by holding back the flames. It is difficult to be precise about where this photographs was taken, but the position of St Mary Major Church, the Cathedral and the tower of the Sacred Heart Church suggest it would have been from a tall building such as Evans Gadd in Smythen Street. If so, the smoking ruins are in Market Street, Guinea Street, George Street and across the rear, in front of the Cathedral, South Street. Photo English Heritage. William Brock and Cornish's survived the onslaught on Fore Street. Beyond is North Street to the left, and St Peter's Corner. The girders and twisted metal is now British Home Stores. At the other end of the City, Paris Street was very badly damaged. Fire-fighters struggled to contain the flames at the top of the street, and they used the Elim Pentecostal Church as a fire-break, to prevent the flames spreading. On the other side of the street, water is directed on the premises below the Palladium Cinema, which had closed at the beginning of the war to be used for some 'national purpose.' The Palladium was gutted. Further down Fore Street – all the shops from Stone & Son, past Mary Arches Street up to just before Cornish's corner were lost. Fire-fighters are shown playing their hoses over the World Stores grocery on the corner of Mary Arches Street. The prominent eagle with spread wings can be seen over the shop front of Stones, which sustained serious damage. Stones relocated to Mary Arches Street after the blitz. The Cathedral Dairy was a prominent business in Eastgate from before the First War, establishing itself with visiting tourists for supplying Devon Clotted Cream. 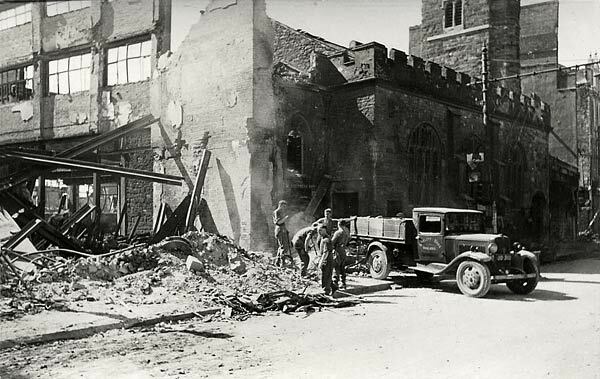 At the outbreak of the Second War it had been taken over by the Exeter Co-operative. 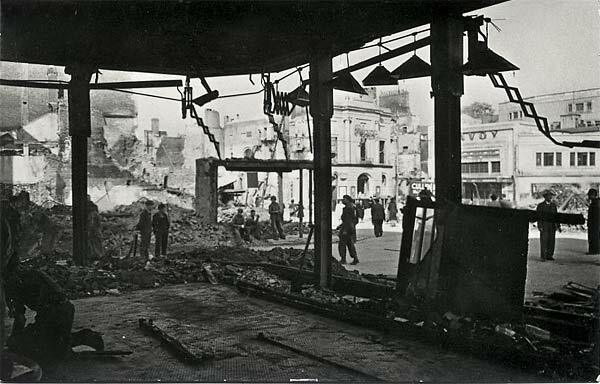 The photograph from inside the shop shows, through the burnt and smashed windows, the Savoy Cinema and the Plaza Cinema opposite. 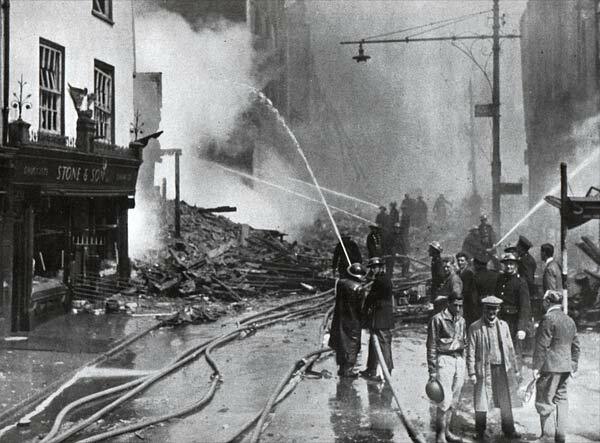 The Savoy sustained minor damage, but the Plaza was gutted by a fireball, when it sustained a direct hit. Ironically, the façade barely looks damaged. The twisted ironwork of Bobby's, indicates how lucky St Stephens Church was to escape serious damage. However, a fire in the tower caused the bells to fall and smash. During restoration in July 2007, it was discovered that incendiaries had also set the roof timbers on fire – it is thought that they smouldered for many months, turning the timber into charcoal, before the fire extinguished itself. Behind St Stephens, Colsons and Bobbys, was Catherine Street. 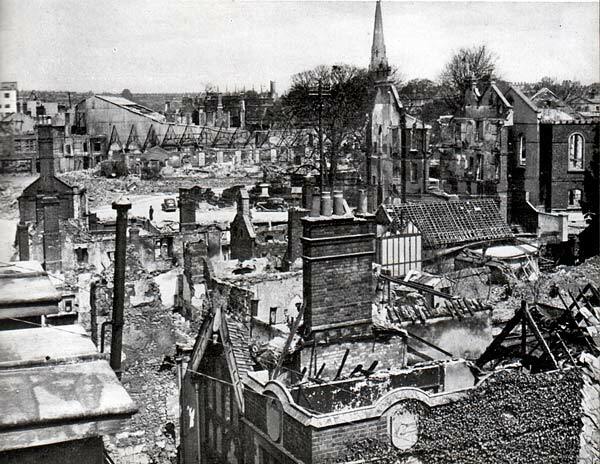 Full of small, plaster and lath buildings, including the Country Inn and Catherines Almshouses, the incendiaries soon did their nasty work. Fire spread from building to building, destroying everything in its path. It took 16 hours to reach Colsons. 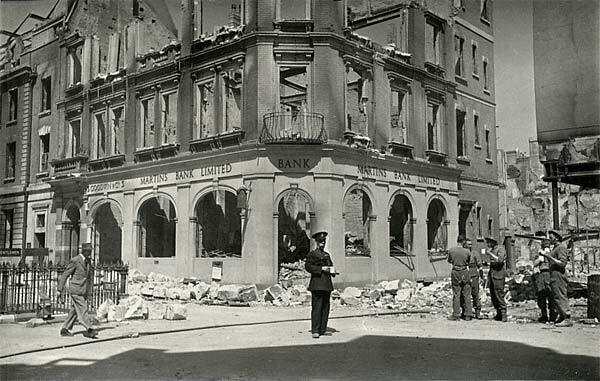 In Bedford Street were two banks, side by side – Barclays and Martins – both destroyed. This photograph shows Martins Bank which was on the corner of Catherine and Bedford Street. The railings to the left are those for the entrance to the underground toilets in Bedford Street. The Cathedral sustained some very serious damage. 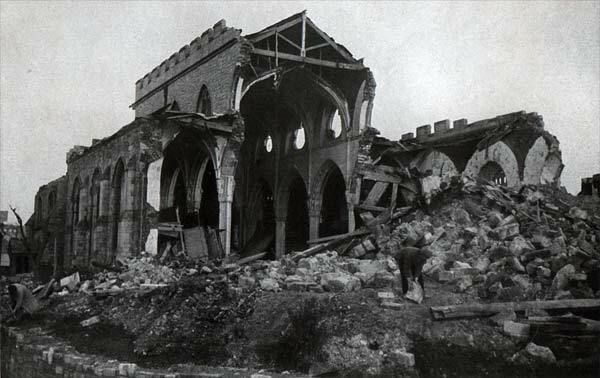 Not only were windows blown out (although the great west window had been removed at the outbreak of war) but St James Chapel was badly damaged, along with two buttresses. 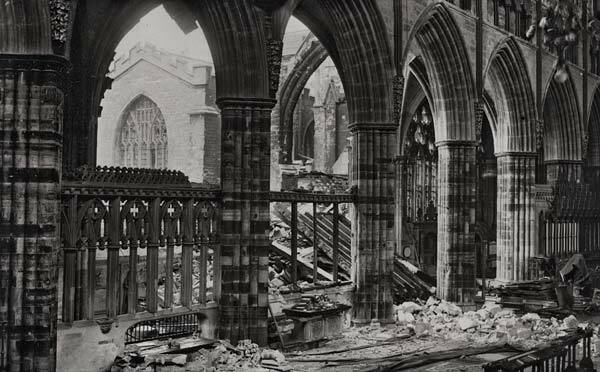 It has been calculated that if any more buttresses had been destroyed, that much of the Cathedral roof would have collapsed. The interior damage to the Cathedral was distressing, with damaged stonework, windows and fittings. 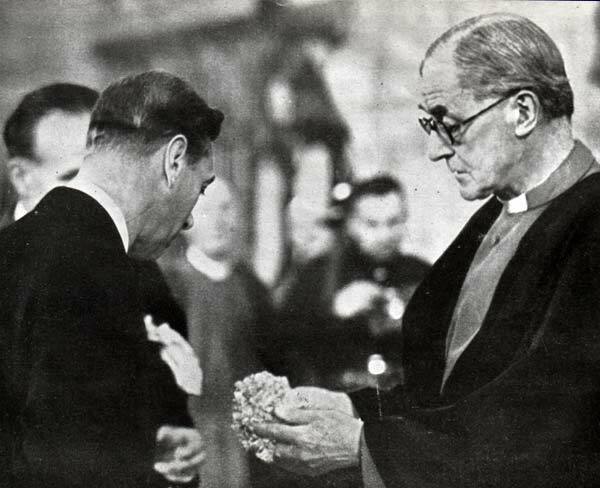 The King was shown a prayer book which had assumed the shape of a tennis ball due to a bomb blast. Later, the Mayoress, Mrs Glave-Saunders gave a present to the King, who remarked "We will not have it wrapped up; we must save paper." As the couple left via St David's Station the King remarked "I think the spirit of the people in Exeter is wonderful." 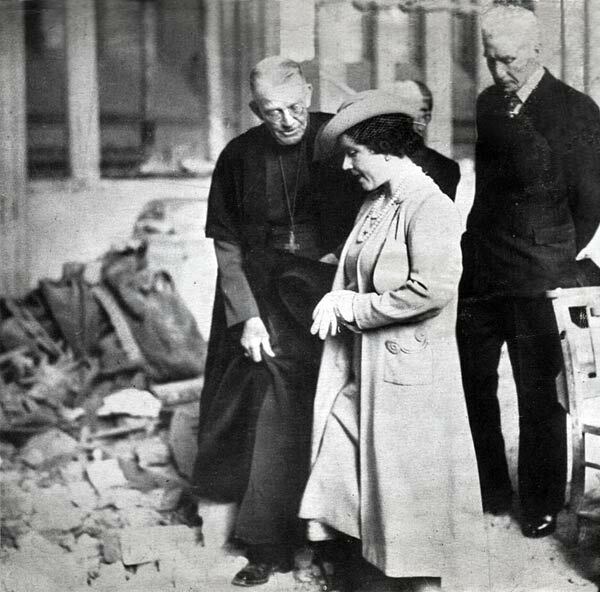 The Queen is being shown some of the damage to the Cathedral. The Royal couple visited the City on Friday the 8th May, and were shown around the Cathedral by the Bishop of Exeter and the Dean. When shown a bomb splinter she said "I hope we give it them back." Later in the visit, the Queen remarked "I hear the people were magnificent... I have been in a London blitz, but this seemed worse because it was so concentrated". 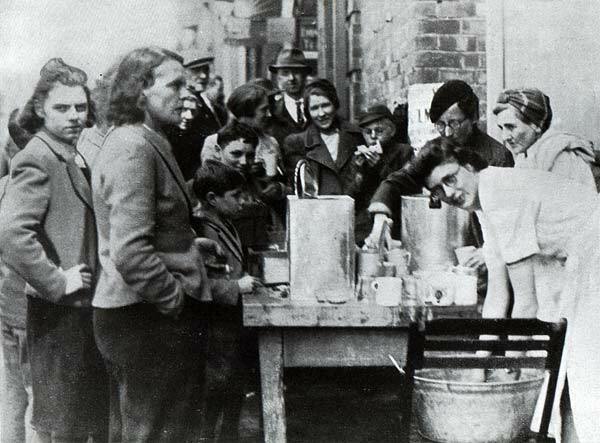 Women and children queue for tea from a table set up in the street. 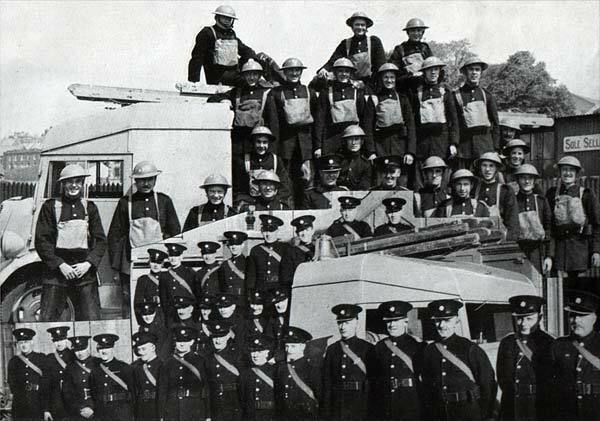 It was probably run by members of the Womens Voluntary Service for Civil Defence (now WRVS), which had been set up in 1938 by Stella Isaacs, Marchioness of Reading, at the behest of the government. 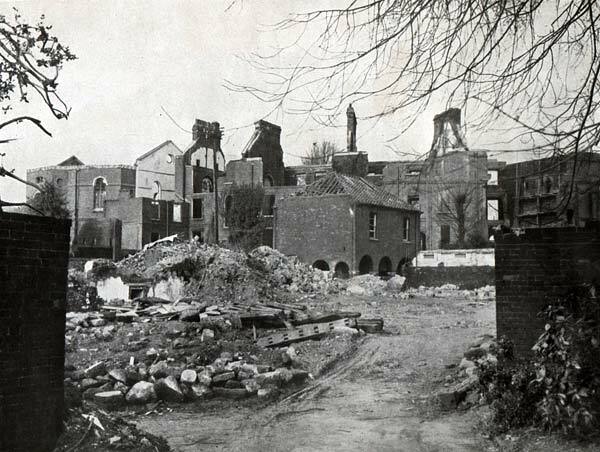 Immediately after the Exeter blitz, a civilian feeding station was set up in Bury Meadow – see Bury Meadow video. 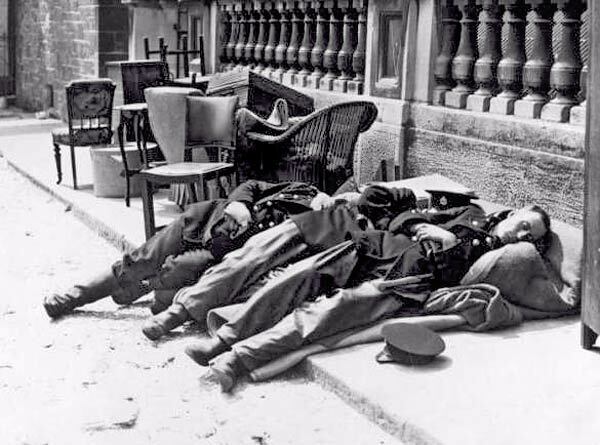 National Fire Service personnel lie exhausted on the pavement before resuming fire fighting. 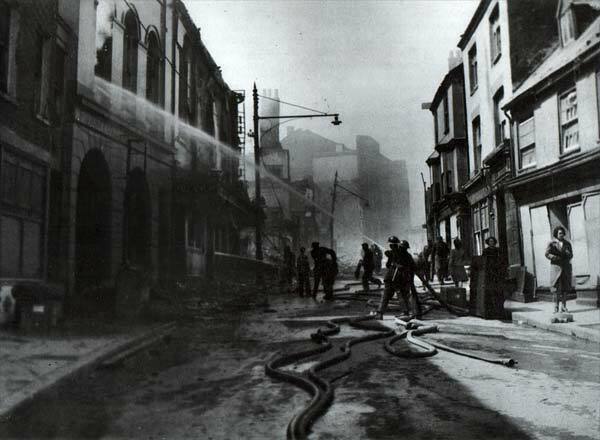 It wasn't until 12.30 on the 7th May that all reinforcements were stood down - 195 Reinforcing Pumps and 1,080 personnel were used during the raid and aftermath to fight the many fires. Photo English Heritage. The Mayoress, Mrs Glave-Saunders organised many events during the war years for the relief of evacuees, comfort for the troops and to raise money for munitions. 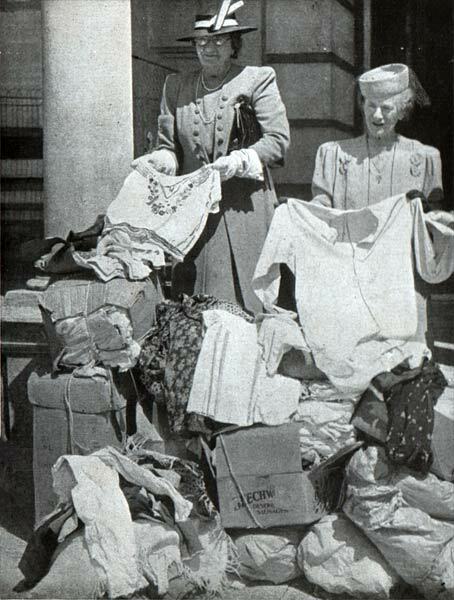 Here, she is shown with donated clothing to be given to those who had lost everything during the night of the 4th May. This is a paste up of group photographs of National Fire Service personnel that appeared in The Story of the Exeter Blitz, which was published by Wheatons during the war. Fire crews from Plymouth, Taunton, Torquay and even one from Reading drove to Exeter, on poorly maintained roads, to assist the local fire service to douse the flames. It was important to maintain contact between the units fighting the fires, the city control centre and the regional control centre, when the telephone lines were down. 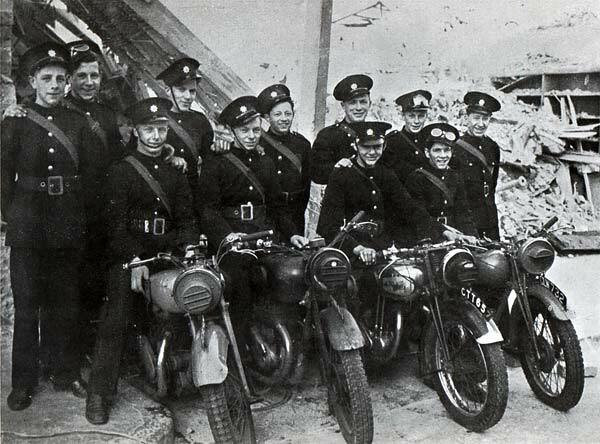 These young despatch riders were used to carry messages requesting more equipment or personnel, or cancelling requests previously made as the situation stabilised. A contingent of boys on bicycles were often the only people who could get through the bomb damaged streets. 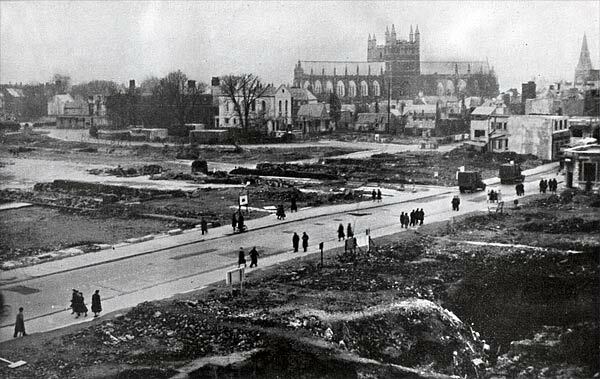 A much published photograph showing the Cathedral across a flattened Bedford Circus, with the High Street running diagonally across the frame. The GPO building occupied the plot of land on the other side of the High Street, left of frame. The building extreme right is the Westminster Bank. 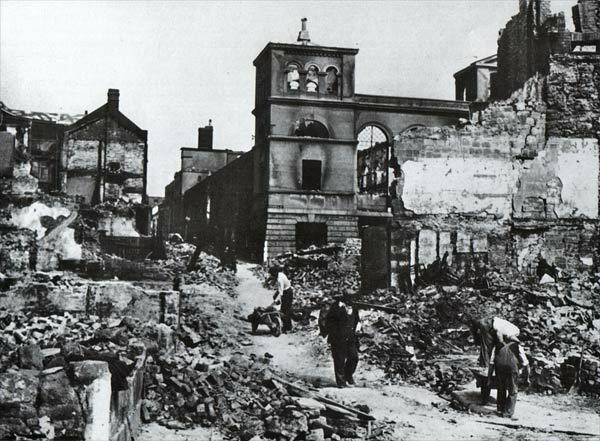 The photograph was taken several months after the raid as the stumps of smashed buildings and rubble have been removed. Another photograph taken several months after the raid, showing a view of St Mary Major Church and the Cathedral from the top of a building somewhere off Fore Street (probably in Mary Arches Street). The main road is Fore Street, with the little street, at right angles, Milk Street. Now of course, you would see the Famous, Jessops and the Chevalier Inn on the opposite side of Fore Street. 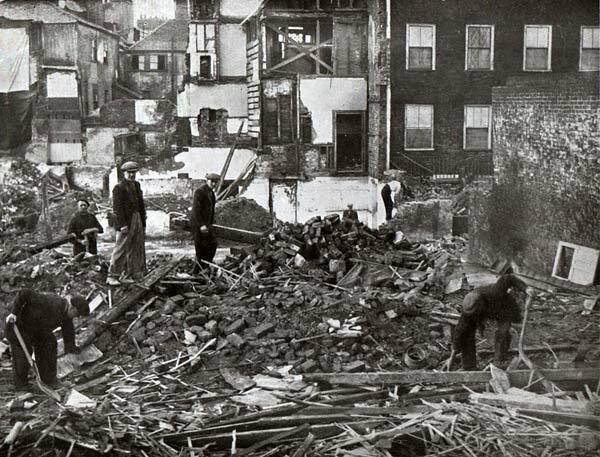 Perhaps two thirds of Sidwell Street was destroyed that night. 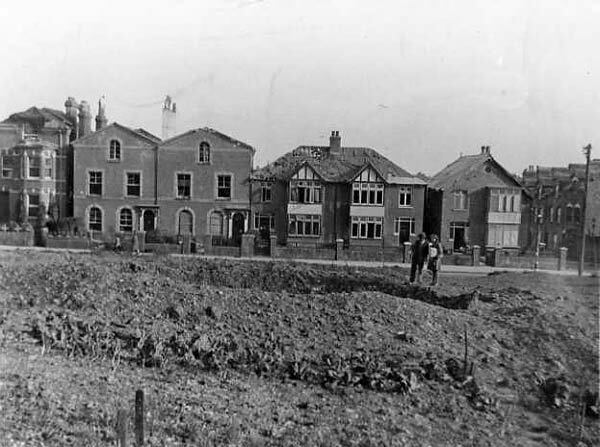 The buildings between the Duke of York and Old Tiverton Road largely escaped, including the Odeon. 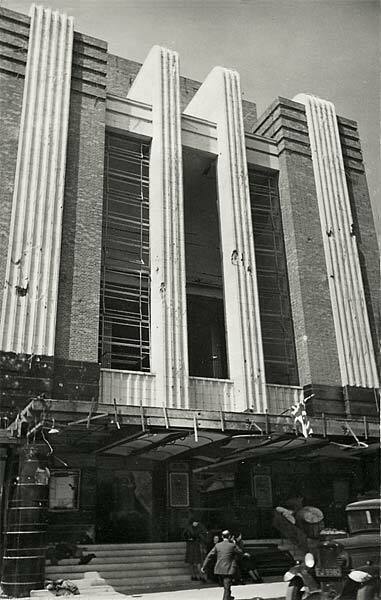 However, a direct hit on a shelter in the middle of Sidwell Street, by the Odeon, caused some blast and shrapnel damage to the cinema. The steps into the Odeon still have missing chunks due to the bomb. Sylvia Hart remembers 'Exeter was not Exeter anymore. You could stand by the Guildhall and see the Odeon Cinema.' 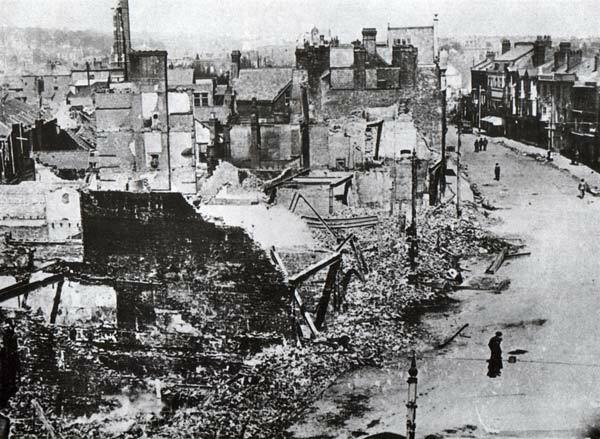 This was a distance of almost ¾ of a mile of devastated High Street and Sidwell Street. 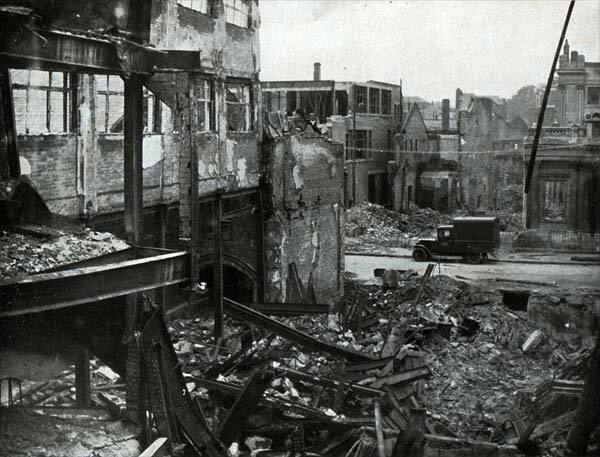 The city end of Sidwell Street, by London Inn Square, was largely destroyed, as this photograph testifies. Nothing remained of the White Lion Hotel and Standfield and White. Now of course, there is the John Lewis store and Sainsbury on this site. To the left is the destroyed Bobbys, and on the right, St Stephens Bow. The bow survives, and is a reminder of a medieval Exeter that has stood for at least 700 years. Another view of St Stephens Bow, although it is more difficult to find. It can be glimpsed in the middle left of the photograph, which is taken from the dangerous rear wall of Bobbys, that still stood. The High Street is beyond, with the remains of the Commercial Union building to the right. The previous photograph was taken from the top of these gutted remains of Bobbys, in Catherine Street. Opposite Catherines Almshouses, what appeared to be a Victorian shop front on the High Street, had this modern, concrete and steel rear. The concrete survived, but the building didn't. 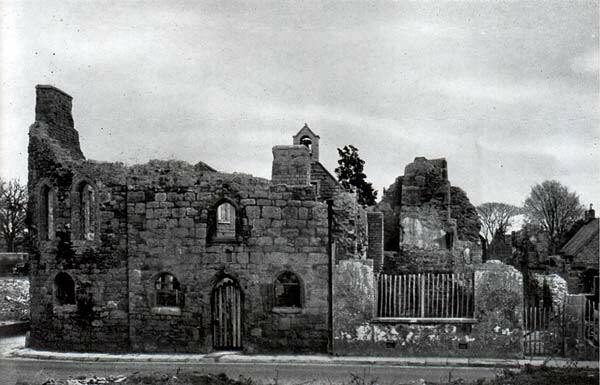 Catherines Almshouses, Chapel and the Country House Inn were all destroyed by fire. St Catherines Chapel was undamaged at midday, but by the evening it was a gutted wreck – James Bell wrote "I remember going into the Chapel, in Catherine Street at 12 noon on the 4th May 1942, walking around and sitting in the pews, There was no sign of the fire which eventually destroyed it - the building next to it was on fire. I was only ten years old! 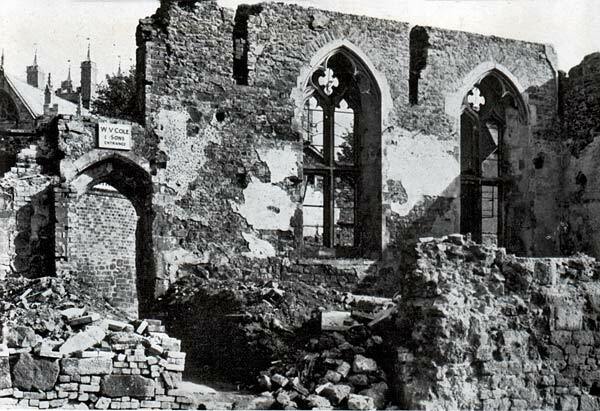 It always raises a wry smile when I read the inscription in the ruins of the St Catherine's Chapel - 'Destroyed by Enemy Action - May 1942'." 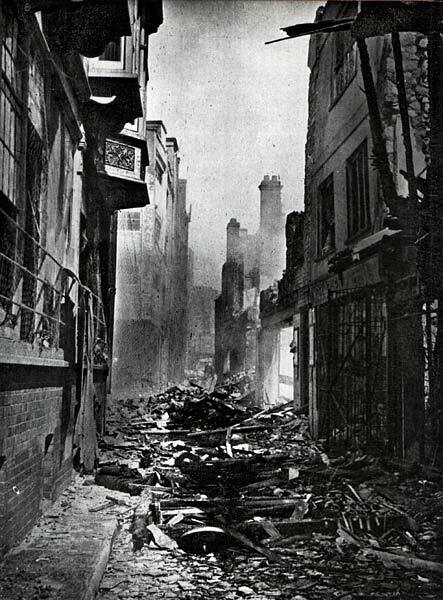 This photograph also appears to have been taken by a photographer risking his life scrambling up the ruins of buildings in Catherine Street, in this case Colsons. In the centre can be seen the bell tower of St Catherines Chapel, to the right, part of Bedford Circus and in the rear, the distinctive ribs of the Bedford Garage and to the left, Bampfylde House. 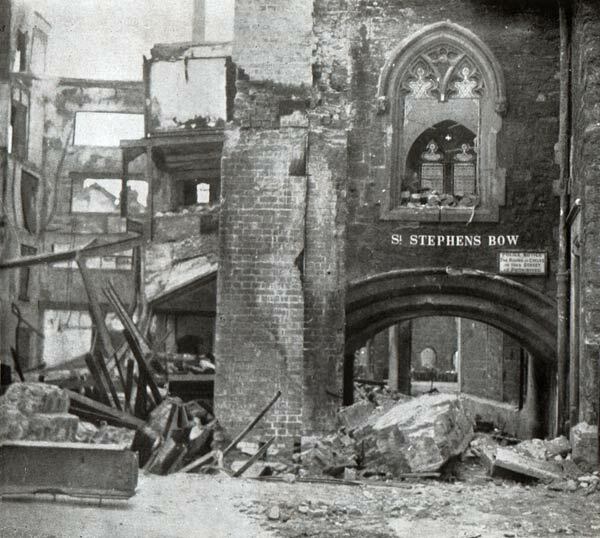 At 2.43 am on the morning of 4th May, a 250 kg bomb fell directly on St Sidwells Church, destroying it and knocking out the water main in the area. The tower did not collapse, but it was so badly damaged, that it was pulled down by sappers, soon after. This photograph was taken some time after the raid as the tower is not evident. South Street was also badly damaged with one of the most ancient buildings in the City suffering destruction – the Hall of the Vicars Choral had sumptuous, oak lined inside walls. The photo indicates that nothing of the interior survived. 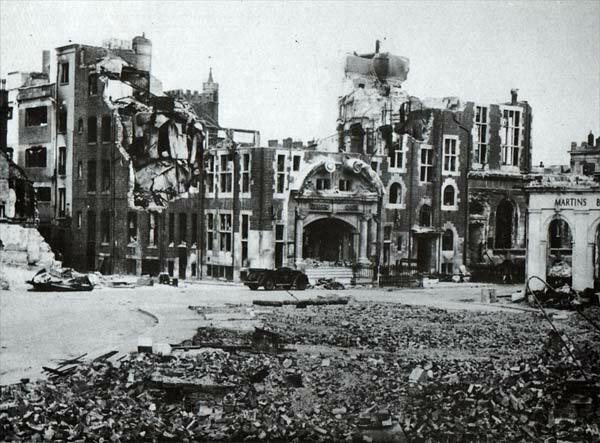 The ruins have been, along with those at St Catherines, retained as a memorial to the 1942 blitz. The much lamented Dellers, the Café of the West was badly damaged during the 4th May. It is thought that oil in the kitchens contributed to the inferno that swept through the building. Although only dating from 1916, Dellers was much loved, with many thinking that the building could have been saved and restored to its former glory. Charles Fowlers Lower Market Hall off Fore Street was a centre of life in Exeter for many small traders and farmers. Dating from December 1836, the blitz did not spare the building and it was gutted. The walls, and corner towers remained until they were demolished for Georges Hall (Corn Market). St Anne's Well Brewery occupied cellars under the Lower Market from 1872, until June 1953 when the building was demolished. The Lower Market cellars were the largest private bonded store in the West of England. 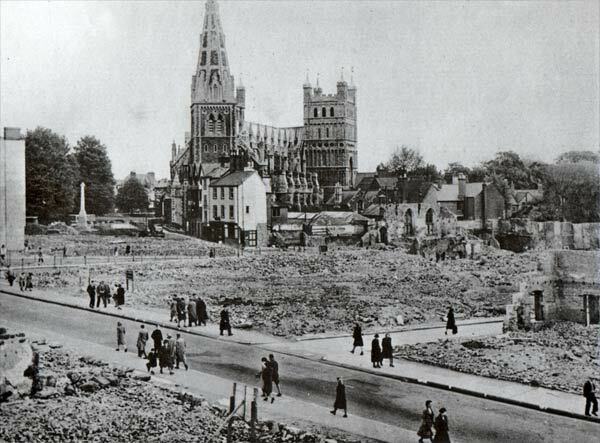 Two important, ancient buildings were lost in Cathedral Close. The Abbots Lodge and Choristers School were favourite buildings for tourists to visit. This view from Cathedral Close shows that nothing remained, while the rear of the burnt out Bedford Circus, and the Bedford Chapel, left, can be clearly seen. 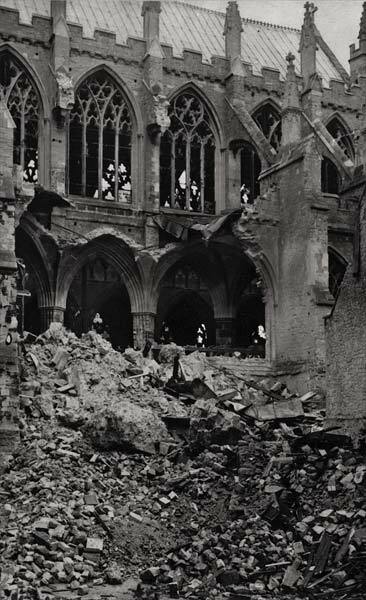 This destruction was caused during the last bombing raid on Exeter, on the 30th December 1942. 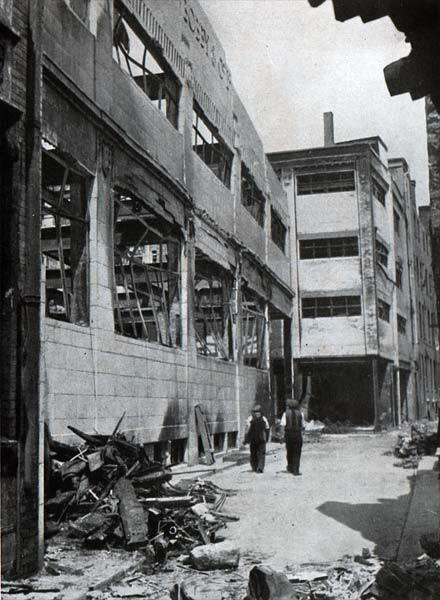 Nineteen were killed in total during the tip and run raid.The rescue workers are shown picking over the ruins at Holloway Street where there were 12 fatalities. 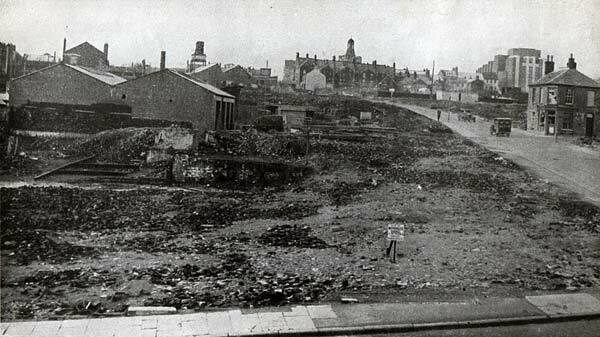 An interesting view across St Sidwells with Summerland Street on the right. The Sidwell Street Methodist Church and the Odeon Cinema can be clearly discerned on the line of Sidwell Street. Odd buildings survived in the centre of the devastated area. 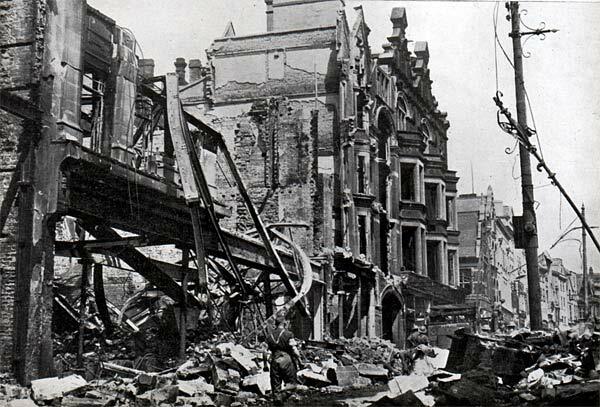 The photograph was taken from Belgrave Road, now Western Way, some time after the raid, as the rubble has been cleared. Even right out at Union Road, Pennsylvania, the locals did not escape the bombers. This photo shows the result of a bomb dropped on the 23rd April 1942. Blast damage to some of the houses in the road can be clearly seen, along with the bomb crater that produced the damage. The photograph was taken some time after the event, as it has been tidied up. Photo courtesy of Tony Lethbridge. 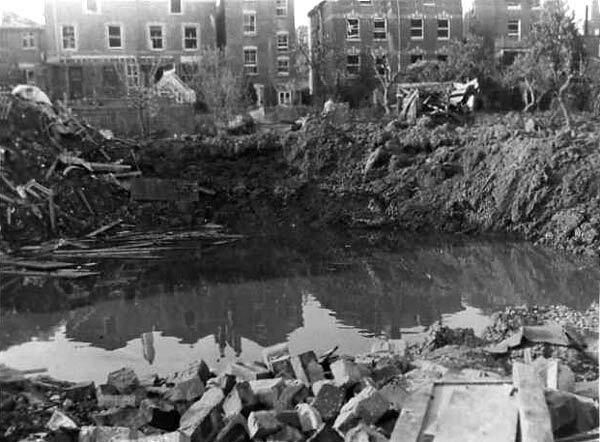 As a companion to the previous photograph, this shows another water filled bomb crater in Union Road. Photo courtesy of Tony Lethbridge.